It is our goal to build long-term relationships with our clients by offering a full range of services. We achieve this goal by working holistically with our clients. Our holistic approach addresses our clients Insurance, Estate Planning, Tax and Financial Services needs. It is our belief that partnering with best of breed Accountants, Estate Planning Attorneys and fee based RIA’s we can deliver the highest level of service to our clients while we remain focused on our core business; insurance. 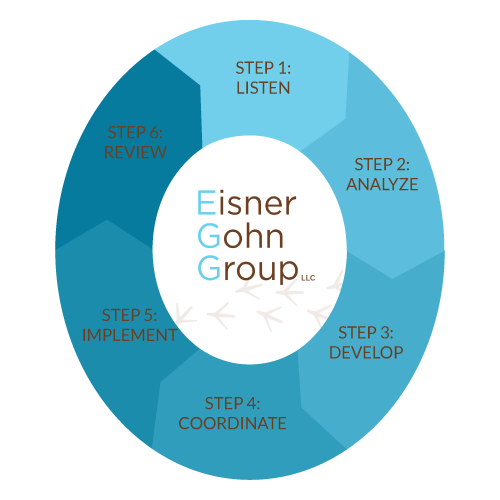 Here at Eisner Gohn Group, LLC, we utilize a unique six-step process when working with our clients. It begins with getting to know you and what matters most in your life, and figuring out where you are right now financially, and where you want to go. From there, we work as your partner to chart the best course of action to help you achieve your goals and objectives while adhering to your personal tolerance for risk. Once you're on the selected path, we continue to monitor your progress and make adjustments as needed as you transition through the different phases of your life. Read below for more details about the various stages of our client-centric process. We get together, listen and review your individual situation, personal objectives and understand what is most important. Every family or business's financial situation is unique. That’s why it’s so important to find out as much as we can about you and your financial goals. The more we know about you, the more precise recommendations we can make and the more we can help you. As a result, we may take some time to discuss your hopes, dreams and objectives and the things that really matter to you. This is the basis for the first meeting with anyone we sit down with. Coordinate your financial activities. We regularly coordinate insurance and financial activities for our clients with the other members of their team of financial, tax and legal professionals. We can do the same for you. Once we gain a shared vision for your plan we'll implement your strategy, and work closely with you and your other third party professionals to ensure its success. We'll monitor progress and provide ongoing service as your needs and situation change over time. Life is not static, your needs evolve over time and so should your insurance plans. Strategies need to be adjusted periodically as your life changes. Your insurance plan has to be able to advance as well. We will meet with you over the years to help keep your goals on track with your changing needs. Neither Eisner Gohn Group, LLC nor its agents offer legal, tax or accounting advice. Please consult your own tax, legal or accounting professional before making any decisions. At Eisner Gohn Group, LLC, we work with our clients' attorneys, accountants, trust officers and other financial professionals to better serve the needs of our clients. This collaborative approach gives our clients the most comprehensive service available. When you work with Eisner Gohn Group, LLC, you can rest assured that we will work with you to develop a mutually agreeable process for interacting with our shared clients. We know that every organization has different methods and preferences for how communication is handled, so we are flexible and adaptable in order to effectively meet the needs of our clients within a cohesive team environment. We will always maintain open lines of communication and keep you apprised of all developments.